Junior Itzel Velazquez talks with some of the students at the first LOL Club meeting. Giggles and squeals filled the cafeteria. Usually full of high school students, the area housed elementary students who were reading and creating pumpkin necklaces. It was the first LOL Club meeting. 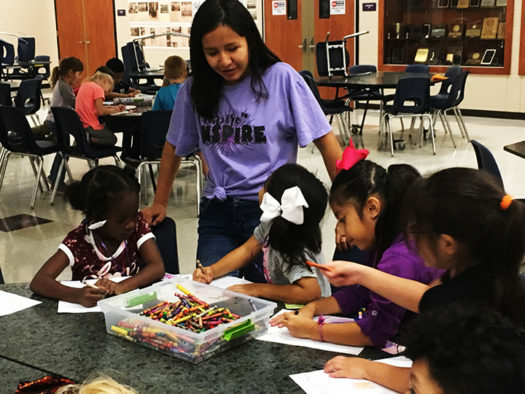 The club – the full name is Love of Literature Club – invites students in grades K-2 to come to the high school for snacks, crafts and reading each month. The club will be meeting once a month to read books, make crafts, and eat snacks. Each month that the club meets will be a different theme. To the club is free to join, but if any of the parents or students want to buy the book of the month they can.